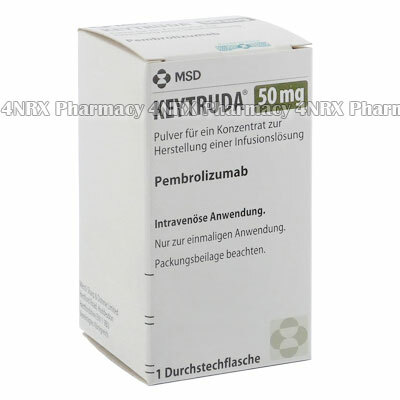 What is Keytruda (Pembrolizumab) used for? Keytruda (Pembrolizumab) is a programmed death receptor (PD-1) blocking antibodyused to treat certain forms of lung cancer and skin cancer where other treatments ahev been ineffective. Keytruda comes in a vial containing 50mg of Pembrolizumab for injection. How should I use Keytruda (Pembrolizumab)? Keytruda dosage is most often 2mg per kg of body weight, given via intravenous infusion. One infusion is usually given every three weeks. What are the side effects of Keytruda (Pembrolizumab)? Other side effects can be very serious. Keytruda works with your immune system to combat cancer. Unfortunately this can sometimes lead to healthy organs and tissues being attacked. Lung Problems (Pneumonitis): shortness of breath; chest pains; new or worsening cough. Intestinal Problems (Colitis): diarrhea; more frequent bowel movements; black, tarry, sticky stools; stools with blood or mucous;sever abdominal pain or tenderness. Liver Problems (Hepatitis): yellowing of the skin or whites of the eyes (jaundice); nausea or vomiting; abdominal pain on the right side; darker urine; reduced appetite; increased bleeding or bruising. Hormone Gland Problems: increased heart rate; weight loss or weight gain; increased sweating; increased hunger or thirst; frequent urination; hair loss; chills; constipation; deeper voice; muscle aches; dizziness; fainting; headaches. Kidney Problems: change in the amount of urination or the colour of the urine. Problems with Other Organs: rash; eyesight changes; muscle pain; joint pain; weakness; anemia. Keytruda (Pembrolizumab) can cause fetal damage. Do you use if you are pregnant or trying to beomce pregannt. It is unknown if Pembrolizumab is passed through breast milk. Use with caution only under medical advise and supervision if breastfeeding.